The weather was lovely on Friday night, so we kicked off the weekend with a family bike ride to check out the neighborhood Halloween decorations. The forecast for Saturday night looked less than ideal for trick-or-treating, so I wanted to make the most of it, and we did. All was well, despite the fact that I didn’t realized my rear bike lights weren’t on until four blocks into the ride — oops! Saturday dawned drizzly and gray, as promised. We made the most of it by baking bread (Matthew) and making chickpea dumpling soup (me). My food lab instructor mentioned chickpea flour dumplings last week in class (I was probably the only one in the room who had every actually consumed them), and I realized I’d completely forgotten about that recipe, which is quite tasty. Fun to bring it back! 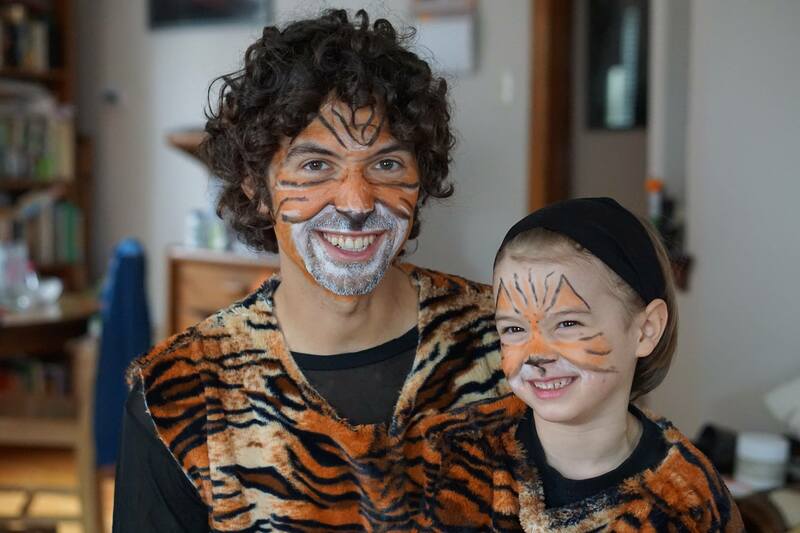 After some post-lunch quiet time, Matthew and Gabriel got into full tiger costume. I’ve got the two cutest tigers in town, and that’s no lion! After a quick visit to Nana and Papa’s, we returned home for dinner (something nice and healthy before all that candy!). Despite my fears, the weather mostly cooperated for trick-or-treating. It was damp when we headed out, but no active precipitation. We walked a few blocks to a street that is very active in trick-or-treating. There were some great decorations, including this kid dressed up as a creepy jester who looked like a statue until he jumped at you. The house with what had been G’s favorite decorations added an animated werewolf for Halloween night, and it was too creepy for my little tiger. About halfway through, it started spitting, and there was a very light drizzle just as we finished. A couple of weeks ago, a friend shared Ellyn Satter’s recommendation for handling Halloween candy, basically putting the child in charge (at least to some degree) to help him/her learn self-regulation. I really like a lot of Satter’s work (mentioned in my “Avoiding Pitfalls in Raising a Healthy Eater” post), so, despite some qualms about these particular recommendations, I decided to give it a try that first night. I told G he could pick out what he wanted, and also that if he was hungry for something else (we don’t usually do a snack before bed, because bedtime is so close to dinner, but we were up late and he had done a lot of walking), he could have a piece of the [fresh-baked] bread. In the end, G picked 4-5 pieces of candy and then asked for a piece of bread. I’ll admit that after each piece of candy, I was wondering, “Will this piece be the last one?” and I wouldn’t have minded if he’d chosen even less candy (yes, I might have some control issues), but as a “sometimes” thing, this was not at all unreasonable. We’re now doing a bit more direction with the candy, and I’m not going for the “as much as he wants at snack time” thing. Mostly I feel like there’s SO MUCH candy for a 4-year-old, and I’m wishing we’d visited fewer houses, as neither Matthew nor I are particularly interested in helping consume the candy stash (we’d prefer our sugar and fat calories from our homemade treats!). Looking ahead to next year, I think it might be more fun (and lead to less candy) if we host a Halloween party, which would include some trick-or-treating for the kids, but would also include games and Halloween-themed food items. Saturday’s rain delayed gardening until Sunday (yes, the garden is still alive and kicking! ), and my tigers worked in the garden while I stayed home and did homework. 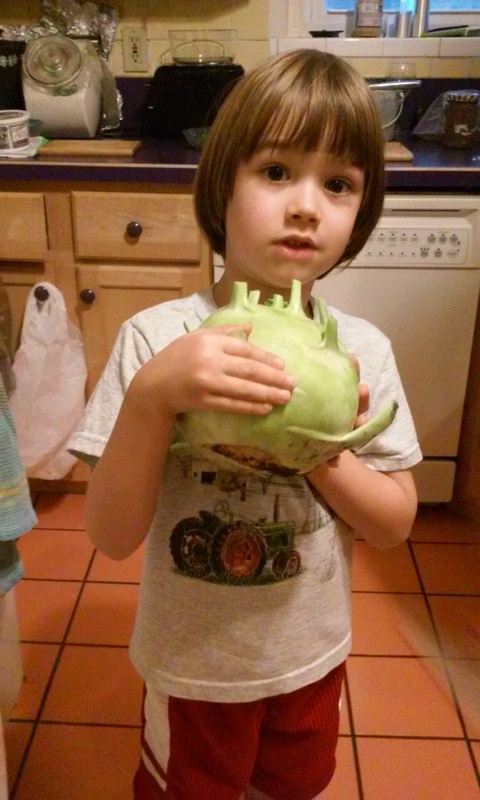 They returned as I was finishing dinner preparations, and G happily munched on some extra kohlrabi before showing me the big ol’ kohlrabi that Matthew had just harvested. And that’s a wrap on our weekend! I have a number of other posts in the works, including one on my no-longer-so-new bike commute, but I also have lots of school-related writing due in the next few weeks, so no promises! This entry was posted in Biking, Cuteness, Food, My Life and tagged parenting. Bookmark the permalink. I would love the chick pea flour dumpling recipe. I now make ours with sourdough to avoid humming us up and would love a fine new option. Tracy, it’s a Bob’s Red Mill recipe — really easy and tasty. It doesn’t look like much batter, but it makes 8 large, hearty dumplings (which is all my pot will hold). I shared it here.